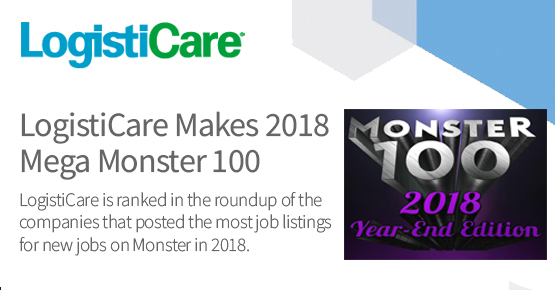 LogistiCare was among those on the Mega Monster 100 with the most, new job listings posted on the career search and recruitment website in 2018. LogistiCare came in at No. 85, with 870 jobs posted. “It’s become my home away from home. We’re definitely more like a family,” said Network Development Representative Tiasha Green of New York City. “I enjoy making sure members get to their appointments on time,” said Edison, N.J. Reservation Supervisor Shawn Pearson. “I waited 10 years to find a place like this … and I enjoy making our members’ days a little easier,” said North Haven, Conn. Customer Service Representative Shavon Smith. “I like my team … We are like a family!” said Customer Service Representative Tysheera Neal of Edison, N.J.
“I like helping people and delivering great customer service,” said North Haven, Conn. Customer Service Representative Vanessa Cacioppo. Well, there you go. Great colleague chemistry plus fulfilling, meaningful work provides a successful job environment. We have no doubt that last year’s “hiring frenzy” brought in even more wonderful LogistiCare talent. Way to go! It’s nice to be recognized as a company for hiring lots of fresh faces, and based on what current employees say, it’s easy to see why our workforce grew in 2018. Make a difference in other’s lives and put your passion into action by joining our team in 2019.